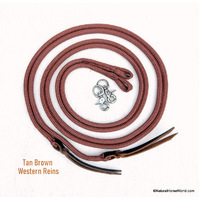 The best looking bitless bridle - looks like a classy traditional bridle. Ideal for shows, pony club, jumping, dressage, hunters and adult riding clubs. Made from quality drum dyed Leather with a padded noseband, browband and headpiece. 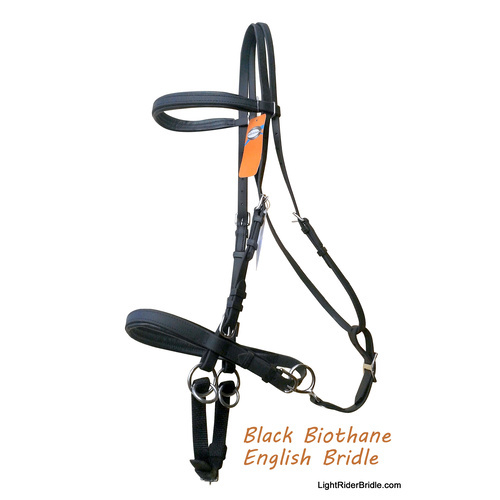 The LightRider English bridle features an extra cheekpiece buckle to allow for a bit to be added if you need one for competitions, or for your transition to bitless. Comes in black, dark brown or tan in drum dyed regular leather and Beta Biothane with stainless steel hardware. Sizes: Cob, Full & Warmblood/Draft - Pony size availabe in Beta Biothane as a custom order - please email us. Absolutely LOVE this bridle and so does my horse!!! I discovered during a routine Dental for my horse that he had 2 melanomas, 1 on each side of his jawline right at the "bit seat" of his mouth. Needless to say, I will no longer put a bit in his mouth. I chose the leather option and it is an attractive bridle, also a good fit! Best of all my horse rides like a dream in it!! I love these bridles and the quality is just amazing and in my opinion very reasonably priced. My horse loves it too! 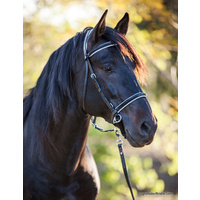 The LightRider English Bridle is absolutely beautiful! I use this bridle on all of my Off-Track Thoroughbreds. Being able to ride them in a bit-less bridle has helped them immensely as they transition off the track into their new careers. 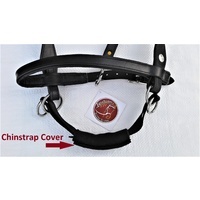 The bridle was supple and easy to adjust right out of the package. 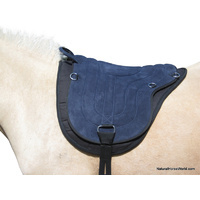 It looks and fits beautifully on all of my Thoroughbreds and I have received many compliments when using it. The added ring under the chin makes this bridle versatile as I can tie, lead and ride my horses without having to change their gear. A beautiful soft quality bridle. My horse loves it and riding has never been so relaxed for both of us. Really can't see that we will ever go back to a bit. I am so happy to finally ride bitless!! The Lightrider Bridle is well made and designed,my horse is softer and more responsive wearing it and I am so happy to have metal out of her mouth. Best Bitless Bridle I have ever tried! I have been riding/training my mare bitless for awhile now. I started her bitless in a rope halter. She was good in that but I felt we needed something that could provide us with more advanced communication. She was previously a barrel racer and that is all they did with her. She only ran and that was it. She would get very hot and would jig all the time in her bit. I decided we would do slow work until she understood she didn't have to run all the time and learned the cues that I was giving her in the rope halter. Sometimes in her rope halter she would get excited and it would let her avoid pressure, would not always be consistent and would slide around. I tried a Dr.Cooks bitless bridle but it didn't seem to give good release and she would get confused. While looking for alternatives I found the Lightrider. Since she was used to a rope halter and had her ground work down she didn't need much time to adjust to it. She has been a dream in it since we got it. It provides superb communication and the design is unique and provides good release. She doesn't get confused anymore and doesn't need a big bit to stop or have her listen. She is much more relaxed and listens even when she gets a little spooked. I just love this Bridle, great colour and very soft leather. Nice padding on brow and nose band. It was easy to adjust and didn't ride up when I asked for stops or turns. I have ordered another for my other horse. Thanks for all your support while waiting for it to arrive in Canada. 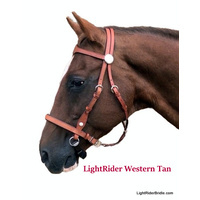 This is my second Lightrider Bridle, and what a beautiful bridle! My horse loves it and therefore I do too. Traditional look with a beautiful light comfortable feel for both horse and rider. It was seamless for both of us to adjust our style of riding (and being ridden) to this bridle. I love it and will never go back to a bit. Product arrived very quickly after ordering and was in excellent condition. I put it on my horse and it was a comfortable fit allowing my horse to be ridden bit less and happier for it. I was using a bitless system previously, but this has been the best product that I have tried. The horse took no time to get used to it. I have recommended this to my friends, and they have also purchased one. they too, are very happy with it. 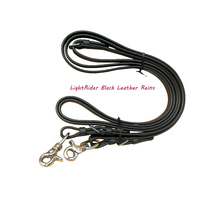 I find the Lightrider English Leather bridles to be nicely made. Even Dafydd, who hates anything on his head and came to us as a head shaker and stumbling pony, is accepting the bridle, which evidences that it must be comfortable. He is even starting to stretch his head out low. I researched which bitless bridle to buy and am very pleased with my choice because my boys have taken to them so well. When I re-bitted Murphy a number of years ago he stopped coming to me within a week. My horses are still eager to come to me after wearing their bridles almost daily for a number of weeks now so they clearly have not formed a negative association with them. For this reason I recommend this product. Good looking and gentle bridle. The bridle looks good and is nice material. I use it with both rings clipped together, better backing and gentler. 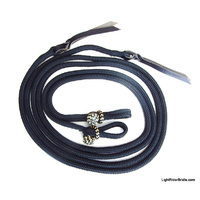 More control and gentler than rope halters and cross under bridles. Only thing a little annoying is the strap that goes from the throat lash to the nose band falls off so easy, I am sure it will get lost unsaddling when out on a ride. 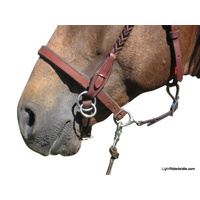 Note from store owner: There's no need to undo the noseband for removal of the bridle, so the connector strap won't fall off. Best bridle ever I have been riding for 50 years from campdrafting to dressage and I love this bridle. I am so pleased with this bridle! My horse loves it and took to it with no problem. With no metal in his mouth to distract him, it allows for more pure direct communication through thought and and body. We enjoy our trail riding so much more! Me and my horse are new to bitless bridles. It took a few days for me and my horse to get used to the different pressure sensation. With the help and advice from Cynthia we now understand better how to use it and we both love it. My horse now offers herself for her bridle to go on. This bridle is well made, attractive - to all intents and purposes looks like a regular English bridle (til you look closer!) and has been a revelation. Such a relief to say goodbye to the bitted bridle. 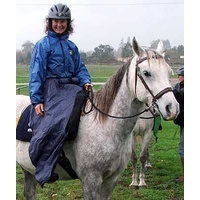 I loved the original one and this is for my friend who never ever would have tried one if she had not seen it on my horse and how easy and gentle it was for him, well done, thank you for making horses lives better. International customer ..... I am so impressed! I took a long time deciding wether or not to order these due to import and postage costs etc. and because my gelding is difficult to fit for a standard rope hackamore due to his unusual head proportions! To anyone out there who is hesitant all I can say is I am absolutely thrilled with this bridle. 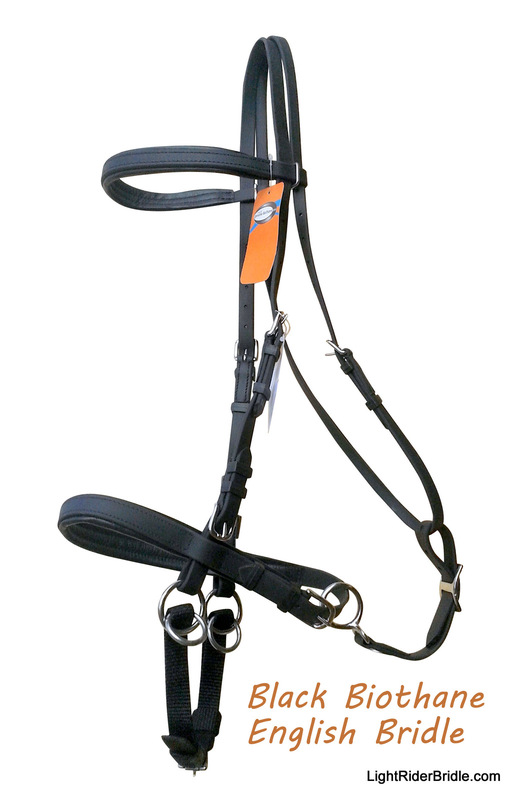 This is the cheapest of the english bridles and it is super soft leather and perfect fit due to its adjustability. It looks wonderful and my gelding has transitioned from a rope hackamore to this seamlessly. My mum who is completely new to bitless riding finds this much easier to use than the rope hackamore. I am equally impressed with the rope LightRider, it fits very well (custom and parelli did not fit him as well as this one!) and the colour is gorgeous (brown and gold zigzag) and leaves no marks on his nose when hacking out.As we progress into longer distance riding I will have no hesitation in coming back to order the rope endurance and the leather western for my filly when she is ready. I cant see any reason to ever go back to riding with a bit and after a lot of research I think this is the best bitless option out there. Thank you Cynthia. Absolutely super on my quarter horse, he accepted it without question and I would recommended it wholly. 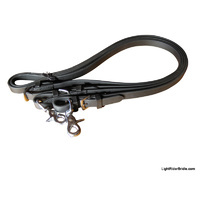 I have had great success with the light rider bridle and would recommend it for educated horses . I am also pleased with its quality fittings and materials . Thankyou again for your prompt services. Kust wanted to say thankyou so much, I placed the order sunday night and it arrived in Adelaide Tuesday morning and then out riding that afternoon.Just like to take a moment and tell you about the English LightRider bridle I bought last year.It has been the best investment I have bought. I have ridden in bitless bridles for the last 3 years and this bridle has been the most effective with a very easy transition. Thanks again. BEAUTIFUL LOOKING BRIDLE AND VERY EFFECTIVE! 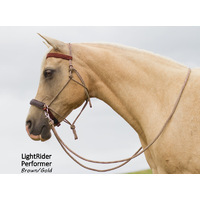 The LightRider English is for my QH Mare who is very soft. We started her in a halter and transisoned to the LightRider English. It works wonderfully, looks amazing and is releases pressure really well! We are currently riding with the LR English for Team Penning, at home and Trail Riding. Would look wonderful at a show. Great quality, fits really well! 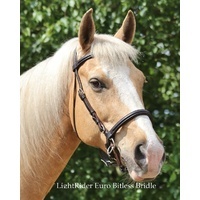 I purchased the English bitless bridle from you at the Equus Inspiration. I am using it on my 7yo arab who has only recently been backed and handled. He has taken to it like a dream, he is so responsive, he was running through the bit and now he is so happy and I have full control with your fantastic bridlle. I was recently in a situation where I thought there was no way I was going to pull him up, but I was able to control him so easily and there was no fighting. I am now completely sold on the bridle. I am very, very happy with my new LightRider bridle. 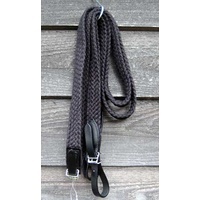 I have tried a few different types of bitless bridles and this is by far the best I have come across.